Galvin Flying, an FAA Part 141 approved aviation training school located on Boeing Field in Seattle, Washington, celebrates 85 successful years in business and a return to private, local ownership. Skip Moshner, President of Galvin Flying, leads the local aviation industry with his recent purchase of the company from Landmark Aviation on April 1st, 2015. With his staff & team of professional flight instructors, the company stays true to the founder’s core values of providing the highest level of customer service in tandem with offering the latest advanced flight training education. Jim Galvin founded Galvin Flying on Boeing Field in Seattle in 1930, just three years after Charles Lindbergh soloed from New York to Paris. Jim made customer service his number one priority and later passed on his vision & the management of the business to his nephew, Peter Anderson, in 1979. Today, Peter serves as Galvin Flying’s Director of Business Relations. Jim Galvin’s legacy of first-class service has endured, making Galvin Flying one of the oldest, largest and most respected independent flight schools in the industry. Over the years, although Galvin Flying was owned by multiple corporate entities, the company values and customer focus have remained unchanged. To this date, Galvin Flying has trained well over 20,000 people from all over the world to fly in Seattle, and has even served as a training facility for US Navy pilot candidates during World War II. Galvin Flying will continue to provide aviation enthusiasts with the finest flight instruction, and a complete, technically advanced fleet of aircraft and training devices. 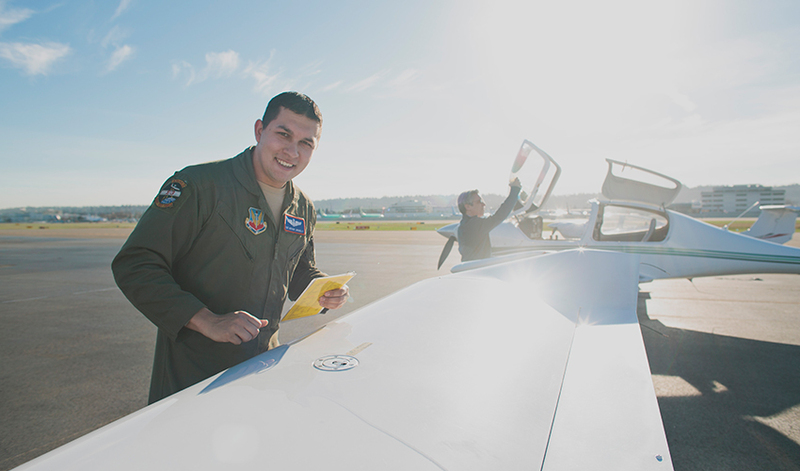 Currently, Galvin Flying works in partnership with Green River College to provide flight training for degree-seeking students, and supports our Armed Forces veterans by offering fully accredited veteran benefit programs. To celebrate the business’s return to local ownership, as well as the company’s 85th anniversary, Galvin Flying invested in the refinement of the brand’s logo and a new website which officially launched this morning.